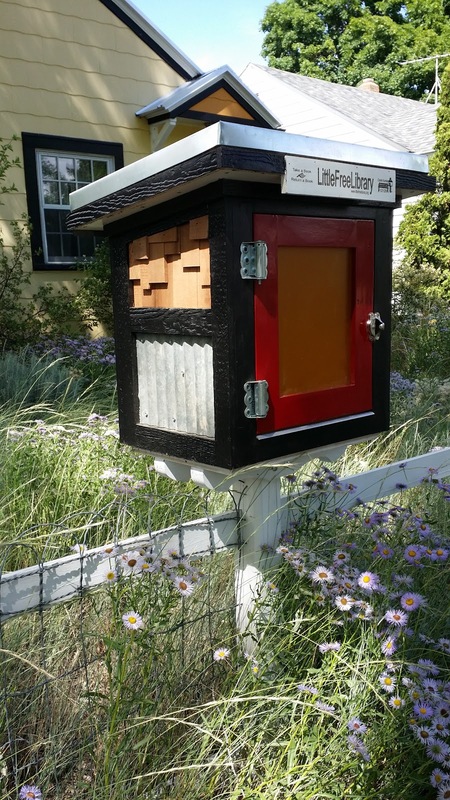 Little Free Library #12129 is in action! 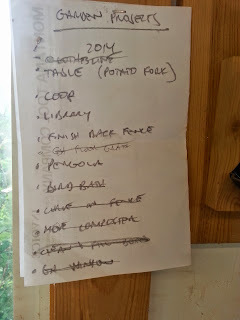 This has been on my project list for over a year, and I am glad to get it crossed off. I love the idea of the Little Free Library, and I wanted to participate and spread the word, but I have no idea how or of it will get used. But really, I like building things. "To promote literacy and the love of reading by building free book exchanges worldwide. To build a sense of community as we share skills, creativity and wisdom across generations." I also I really like that they encourage reuse in building libraries and initially all the libraries were built with recycled materials. Like most of my garden projects, I made this from materials that were reused or re-purposed and all form Home ReSource. Mostly these are leftovers from the chicken coop construction, and it shares a lot of similar style and materials. 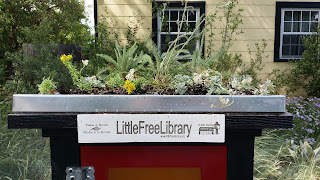 A unique feature to this little library is the green roof. 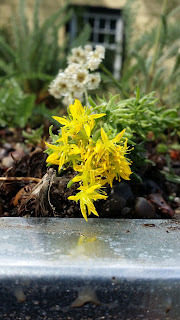 On it I planted spearleaf sedum (Sedum lanceolatum), yarrow (Achillea millefolium), and pussytoes (Antennaria rosea). 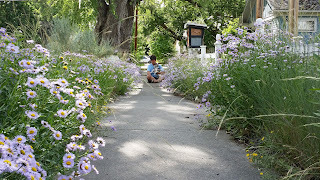 The library is surrounded by flowers now, but will be a nice bit of structure and a focal point in the garden yearlong. It is perched on a fence post, just across the sidewalk from a bench we installed years ago. This also reminds me that I really need to complete building the fence! 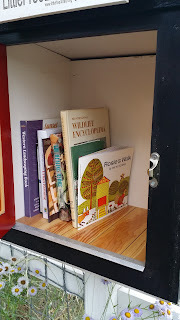 I love that the Little Free Library package comes with labels reminding people that these books are "always a gift, never for sale"
I want this library to have a garden and landscaping theme, and these are the books I started with. 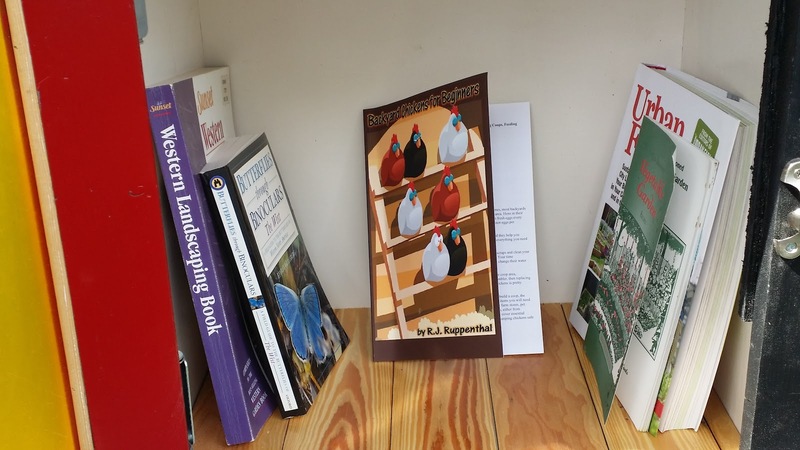 Books ranging from chicken keeping to western landscaping and butterfly identification (of course). Last night, the first night the library was in use, I heard some neighbors checking it out. I was glad for that, but also (I have to admit) a little concerned! However, I was so excited and delighted to look in the library this morning and see new books! 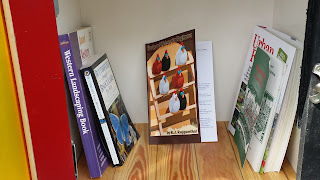 Not only did a neighbor leave new books, but they also fit the theme. 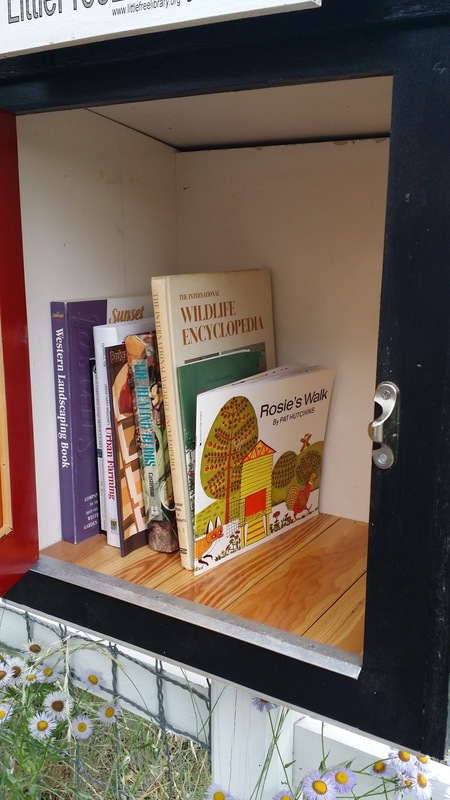 This was so gratifying and it really emphasized to me how a Little Free Library can build a sense of community, just like their mission. I didn't expect to be so excited and surprised that someone would leave books (even though the motto is "Take a book, return a book"). 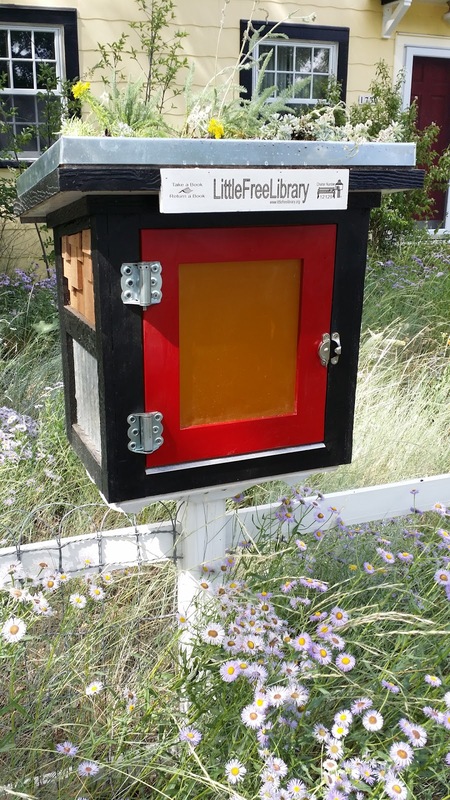 Without much of an explanation of a Little Free Library, people get it. It is exciting to be part of this and to see that it's working. If you are in the neighborhood, please come by to take a book or leave a book! What a neat idea. 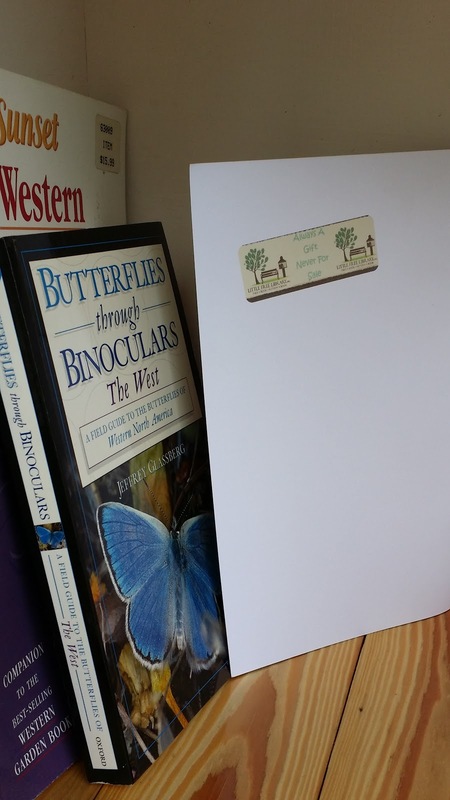 When I was a teacher, I always had a basket of some kind set up with a sign to take a book; leave a book. But I never thought of doing it in my garden. I did pot up prunnings and set them out for adoption which also helped build community. This is fantastic, David. I love the little free libraries (and, truth be told sort of added it to my mental to-do list a couple months ago--though I am not so comfortable with building things.) Your green roof is superb--and how fitting. I am glad its already serving its purpose and I am sure many will benefit from your neighborhood garden library. Good work! I love these little libraries and overtime I see one, it's much fun to open the door to find really good reads inside.